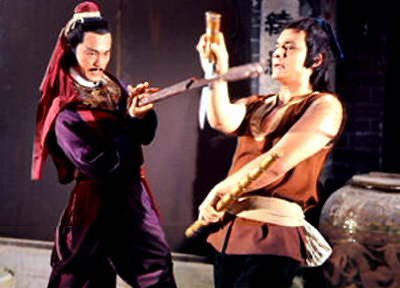 It would be silly to recount the plot of 1979's The Deadly Breaking Sword as, clearly, it's secondary to the action on display here and, obviously, the Shaw Brothers martial arts films of this era all seem somewhat interchangeable to me. I know that's a horrible thing to say but, really, it comes down to the performers to keep me interested -- I'm not a big enough kung fu fan to just watch for styles of fighting, or something. This film at least does have a great cast: Ti Lung, Alexander Fu Sheng, Shih Szu, Ku Feng, and so on. Okay, so Tuan Changqing (Ti Lung) has the broken sword of the title -- and he also goes by that name. I think. Then Alexander Fu Sheng shows up at a gambling den/pawn shop and has a great fight scene using various fighting styles -- this scene was pretty creative and funny and it's easy to see why Fu Sheng was a big star. It's pretty clear from these early scenes that somehow the paths of the regal swordsman and the gambling funnyman are going to cross so it's just a matter of how the plot will get them together. So a famous prostitute arrives at the brothel in town and Fu Sheng sneaks into the place during a fancy party and Ti Lung catches him. Then Shih Szu tries to get Fu Sheng to kill a guy for her, there are flashbacks, more sword fights, ominous music, and so on. Michael Chan makes a pretty good villain. Still, the film is a bit too long and Shih Szu and Kara Hui are wasted in this as neither one participates in any action scenes. You can get the original region 3 DVD of The Deadly Breaking Sword here.